Deadpool 2 cannot get here fast enough! Aside from Avengers: Infinity War, this is my most anticipated movie of the year. What Ryan Reynolds and company did with the first film was just spectacular. They really got lightning in a bottle with that one, which makes doing a sequel all the more challenging. John Wick co-director and Atomic Blonde helmer David Leitch is stepping in for original director Tim Miller, and I have become less and less nervous about this switch with each passing day. I loved what Leitch did with Atomic Blonde, and as long as he delivers on the action-- with Reynolds and his writers handling the comedy-- I think we could get something really special with Deadpool 2. Now, rumors have been going around that Deadpool 2 had poor test screenings and they were going back to reshoot large parts of the film. That has since been debunked. 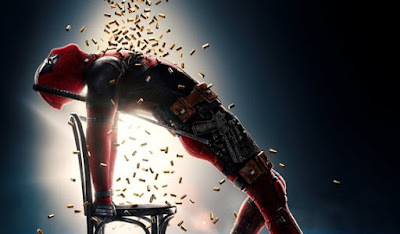 The test screenings for Deadpool 2 have actually gotten even more positive reactions than the first one, and the reshoots are minor and are only to record new jokes based on new Marvel movies that have come out since they originally filmed. But even though those rumors have been proven to be 100% false, it did shake some people's faith in the movie. So it makes complete sense that they dropped their third trailer for Deadpool 2 today, which hits theaters on May 18th. I posted this on my social media, but I'll reiterate it here: I thought this Deadpool 2 was just as good as the latest Infinity War trailer, if not slightly better. You can watch the Infinity War trailer here. If I am not mistaken, this is our first redband trailer for the movie, which is refreshing to see. I've liked the previous trailers, but without all the blood and gore and F-bombs it's not truly Deadpool. Getting to see this character in all his uncensored glory put a smile on my face. The jokes are all great. It's very much in line with the style of the humor in the first one without simply rehashing all the same jokes. The action definitely looks like it is a step up from the first one. One of my criticisms of the first Deadpool is that the action isn't as great as it could have been. It definitely has good action, but it certainly could have been improved. It just shows that Miller's skill set is more narrative and character development, which Deadpool excelled at. But under Leitch's direction, it looks like the action will be ramped up significantly, and I can't wait to see it. And, of course, one of the biggest surprises of this trailer is the introduction to the X-Force. We knew this film would introduce them, but I didn't think it would be to the extent evident in the trailer. That is something I'm really looking forward to seeing. I'm starting to have a sneaking suspicion that Deadpool 2 might be better than the first one. I wouldn't bet all of my money on it quite yet, but I'm thinking they have a great film in store for us. What do you think? Did you like the second trailer for Deadpool 2? Are you planning on seeing the film? Leave your thoughts in the comments section below.